In 1996 the San Mateo County Parks Commission approved the creation of Friends of San Bruno Mountain (FSBM) and granted its permission to create a botanical garden of native plants on park land. For several years the Habitat Conservation Plan (HCP) Trust Fund supplied funds to purchase native plants for the garden. 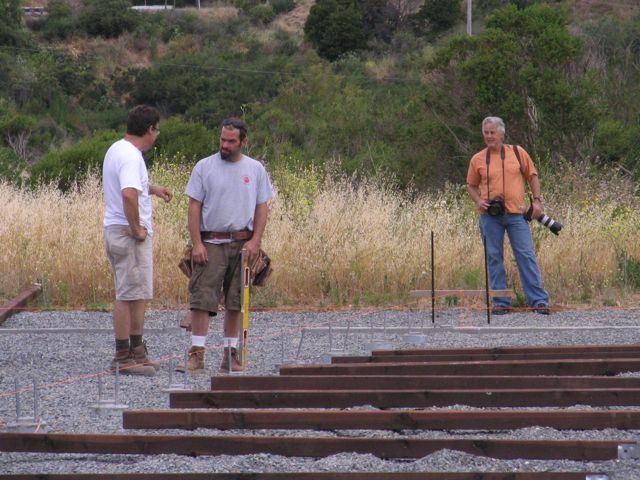 In 2001 Eric McHuron, who was the geotechnical engineer for South San Francisco, secured an agreement with the city to start a native plant nursery in an old greenhouse complex at Orange Memorial Park. Founder and President Kathy Manus, Vice-President Doug Allshouse and Eric McHuron attended a Trustees meeting and secured $3000 in lieu of future plant purchases as seed money to start the nursery. It was unanimously approved. Named after the iconic butterfly that spawned the creation of the nation’s first HCP, Mission Blue Nursery began its transformation from a horticultural hothouse that grew commercial food herbs to a native plant nursery. The task involved removing over 4300 panes of glass from the structure to convert it into an open-air space with only a frame of Lebanese cedar. It was outfitted with a propagation shed, a work area with tables, storage cabinets and sinks, and tables to harden plants. The storage cabinets and sinks were rescued from a senior center that was scheduled to be razed and the shed and tables were built from leftover materials from nearby housing developments. An irrigation system was installed that was controlled by a computerized timer that guaranteed timely watering of plants. The genesis of the project focused on plants grown exclusively from seeds and cuttings gathered on the mountain to guarantee genetic purity. The nursery supplied native plants for the botanical garden, the UCSF native garden on Mt. Sutro, grasses for an oxalis removal project in Juncus Ravine, several Brisbane school gardens, the Quarry Road trailhead, and several Brisbane gardeners. In early 2005 FSBM was notified that the city had decided to raze the greenhouse complex as part of an urban park renewal plan. A conversation with Brisbane Councilman Michael Barnes at the 2005 Brisbane Restoration Day led to an introduction to Mike Pacelli of Bay Relations who was representing Universal Paragon Corporation (UPC). Fortunately UPC rescued the vision of growing native plants by supplying a parcel of land in Brisbane and the Brisbane Planning Commission and City Council endorsed the nursery’s relocation. Thanks to donations of volunteer labor, gifts and discounts of materials, it is now resurrected in its new location in Brisbane behind the Brisbane Fire Department. It has completed its journey around the southeastern boot of the mountain. Below is a photo summary of the nursery's construction, which took most of 2009, and important FIRSTS. The FIRST pancake breakfast at the nursery (August 2009), the FIRST nursery volunteer workday (October 2009), the FIRST outplanting - back to the Mountain (!!!) - of plants grown in the nursery (December 2010) and the very FIRST native plant sale (March 2011). All of this progress happened thanks to many, many dedicated volunteers and donors of time, expertise and money. Major players responsible for the construction of the nursery, making all of this possible (in alphabetical order): Doug Allshouse, Paul Bouscal, Joe Cannon, Joel Diaz, Bill Freedman, Jerry Kuhel, Eric McHuron, Ken McIntire, Marc Salmon and Jake Salmon, Del Schembari, and Tom Williams. Thanks! FIRST - December 2010 - planting of MBN stock!